Three men have been arrested after the London headquarters of major oil firm Shell was targeted by climate change protesters as Extinction Rebellion (XR) demonstrations were staged across the capital. 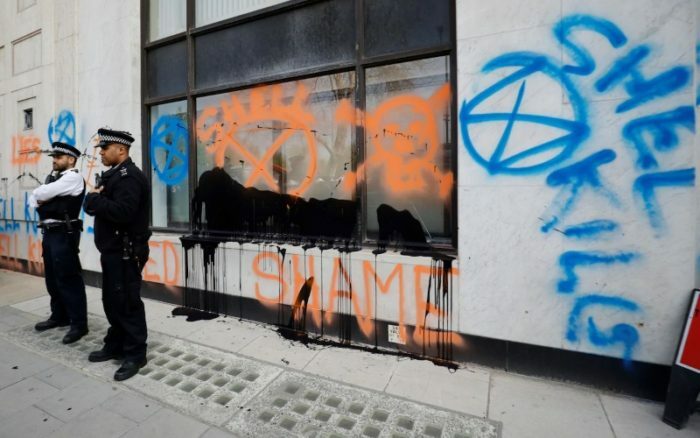 Police were called to the Shell Centre, near Waterloo station, to reports of a disturbance after the building’s revolving doors were shattered and graffiti was daubed on to the building. Scotland Yard confirmed three men were arrested on suspicion of criminal damage. Messages such as “Shell kills” were sprayed on to the property, while a female climate change activist glued herself to the door of the building.